Few books have inspired me like this one has. It’s wonderful!! 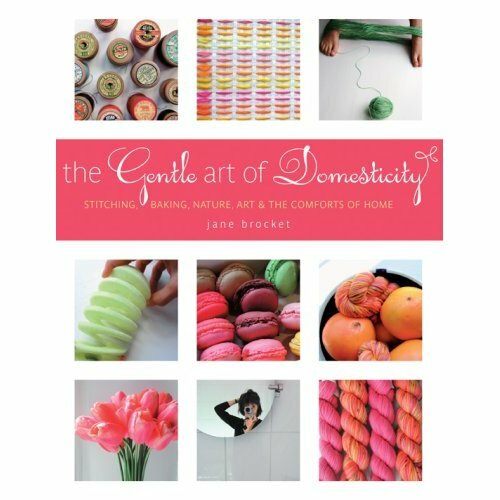 Written by Jane Brockett, it’s a beautiful celebration of the domestic life. The book is filled with gorgeous photographs that I could spend hours just looking at. And although it’s not written from a Christian perspective (there are very slight feminist touches in one or two instances), the whole theme is wonderfully in harmony with the Titus 2 description of homemakers. For the gentle arts are just that: gentle. They do not demand to be practiced. No one is obliged to pursue them. They have not been taken up by any government department and regulated and repackaged with health and safety messages and warnings. They are a matter of individual and personal choice. They can be enjoyed by anyone with an interest and the ability to thread a needle, break an egg, choose a color or wield a pair of scissors. They don’t require complicated skills, qualifications, training or equipment. They don’t take up much space, create dirt and mess (although you may find yourself leaving the house covered in little threads or fibers) or impinge on others’ lives. What they do require, though, is a conscious choice to do something “old-fashioned” and “quaint,” to choose not to buy and consume endlessly, but to make and create for a change. …And that is the second important message of this book. If it inspires anyone to take a shot at making something, to discover or rediscover the delights of domesticity, to try something new, then it will fulfill its purpose. As a domestic artist with absolutely no artistic background or training, I can say with complete confidence that there are no right or wrong ways when it comes to the gentle arts, and that the only way you will learn is to give them a try. The entire book is a delight, and one that I continually enjoy flipping through and getting “re-inspired”. There are sections devoted to lists of black-and-white movies that go well with knitting socks, the adventures of the author’s daughters while making homemade colored (bright blue!) marshmallows, recipes for things like “jam tarts” and , beautiful paintings that depict scenes of domestic life, and the author’s joy in creating quilt patterns with the help of her teenage son. It reminds me of the joy and beauty that fills homemaking. It points out beauty, causes me to stop and enjoy everyday things.